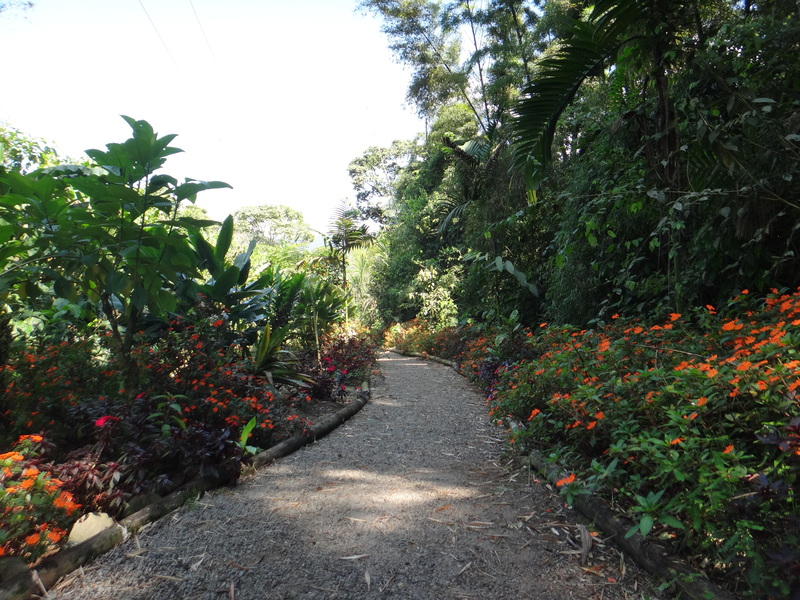 Mindo is known to most as a bird watcher’s paradise. 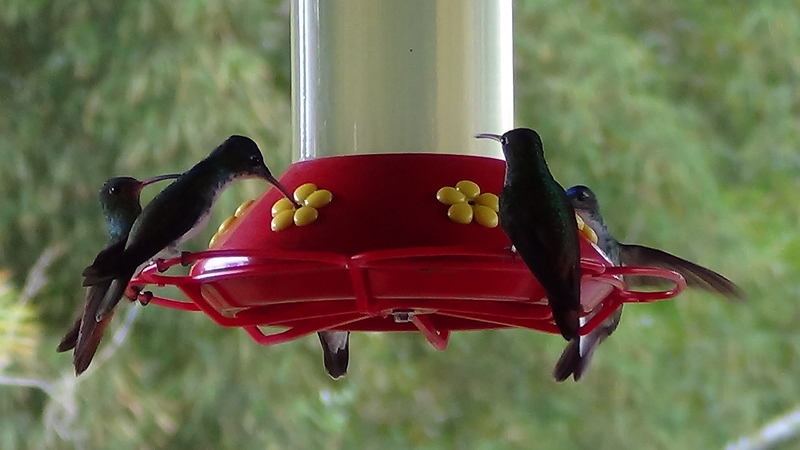 By no means am I an avid bird-watcher but I love immersing myself in nature and I adore hummingbirds. I knew I could easily find serenity in Mindo. The trip was not going to be a straight shot. We would have to take one bus to the next station and another transfer from there. I was prepared for another long day of traveling. I had not been prepared to be on the slowest bus out of Tena. I truly appreciated the bus driver’s caution but he was passed by everyone on the road-even the trucks with cattle in the bed! What should have been a four-hour trip turned into six. Ending up at the bus station on the south side of Quito instead of the North added even more time to our extended trip. After four buses, we finally heard the call for our stop, “Mindo!” We grabbed our bags and got out. Looking around, it quickly occurred we were not yet in Mindo. It was pitch black and there was not a light in sight. A sign stated Mindo was 6 miles away and an arrow pointed down a long dark, winding road. “Six miles?! Thanks bus driver!” I shouted as I looked at Captain; we were both a bit disturbed. We started making our way towards Mindo when all of a sudden headlights flipped on from the shadows behind us. We both spun around, feeling as this were a scene right out of a scary movie. A jet black car started inching its way towards us. The car got closer with every step and as we picked up our pace, as did the creeping ride. My heart was racing and I could feel Captain’s nervousness as well. Captain, finally standing his ground, whipped around to face the man in the car head on. The car rolled to a stop. My mind began racing…the driver’s tinted window slowly slid open. Out popped a young Ecuadorian kid. “Hola amigos! Need ride? Six dollars!” We needed a ride and this man needed a lesson in subtlety. Stalking your prospective clients is not encouraged! Once our heart rates slowed, Captain, assuming we were being gringoed, bargained with the man. “3 dollars.” The man stood firm with his initial price. I was in no mood to negotiate after the dramatic introduction. It was pitch black so it was either pay the six bucks or continue on dangerously. This surely was a convenient business arrangement of the bus driver and the driver of the car. The ride was our safest bet so we hopped in with the kid. His car was immaculate. I suppose these 6 dollar rides were serving him well. The ride was overpriced but we would have ended up walking for quite a while. 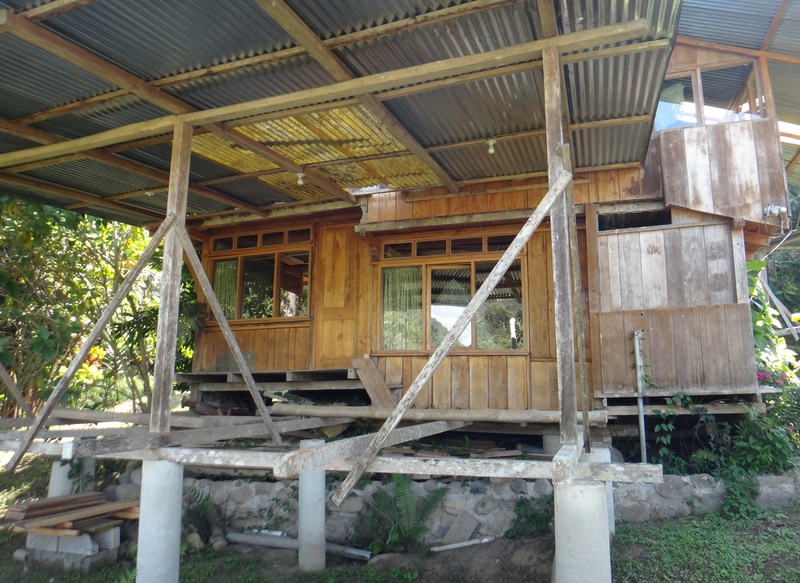 Mindo is a touristy area so were had little concern finding lodging for the night without our guide-book. After being dropped off by our stalker, eating was my first priority as a long day of snacking on the bus wasn’t going to sustain me much longer! We found a nice little restaurant that had typicos platos. As we were ordering our fish, rice, beans and yucca fries a young gringo happened into the restaurant as well. She wore a big smile, was very friendly and ended up enjoying dinner with us. The woman told us about her ten-dollar room and the always budget-conscious Captain was thrilled. I obliged but I was sure I was looking for a bit different experience of Mindo. We didn’t get a great look at the place until we were all checked in. The six-year-old at the front desk should have been our first inclination of what we were getting into. His parents were nowhere to be found and obviously he had done this before. He took our ten bucks, grabbed the key and led us to our room. There was another couple that was checking in as well and they got the room above us. The place looked like it had been nailed together with scraps of wood and there were large gaps between each piece. Perhaps it was the young boy’s own construction and room to rent out! The creaking floor amplified every sound of the couple moving above us. I had my mind made up that I would not be staying here for the rest of our days in Ecuador. When I walked into the bathroom, I knew I could easily convince Captain that we would be moving on the following day. The was a huge hole in the bathroom wall! It was at least three feet long and almost a whole foot tall! Why would they leave this space that welcomes any critter and insect into our room?!? We slept as good as expected and in the morning enjoyed a breakfast with the other guests. I even recognized a familiar face. The woman whom shared her guide-book in Banos sat right next to us at breakfast! Sure, we were along the Gringo Trail but really what were the odds? It had been at least four days since we last saw her. There were many activities others had planned for the day: chocolate factory tours, tubing down the river and soaring through the treetops on a canopy tour. My first objective was a walkabout to find new lodging. Captain and I are budget travelers, obviously, but we agreed, the next days it would be worth splurging on a clean, comfortable room with a peaceful experience of Mindo’s natural beauty. When I found the rustic inn on the edge of town, I knew this is where I would be staying. Lush plants and tall trees surrounded the lodge. There was a small stream running along side the place and small balconies off of each room. The line between nature and guest rooms was blurred. The space felt very sacred and would be a perfect place for reflection. 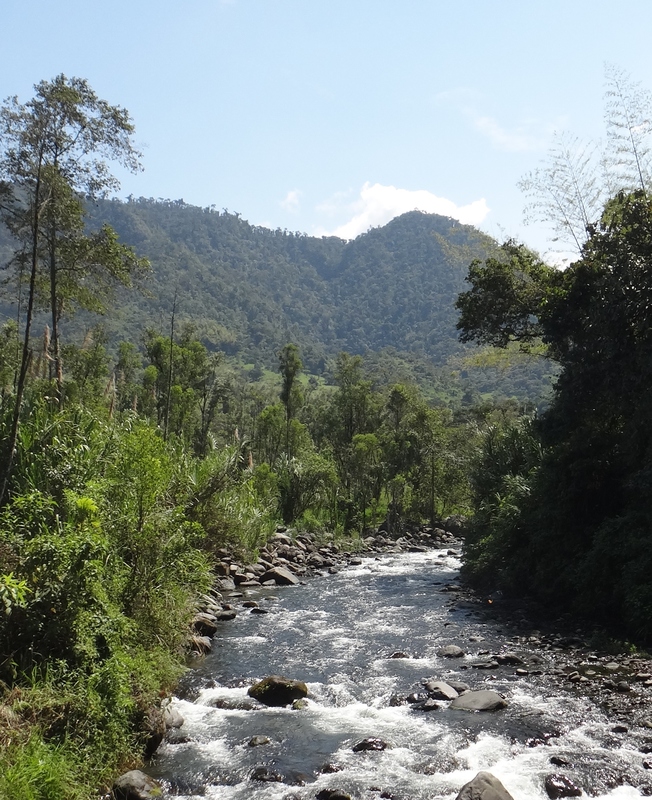 There were many adventurous activities in Mindo but we decided on a simple chocolate tour. I love chocolate and Ecuador is famous for its cacao! For six bucks we learned about cacao beans, how they are grown and cultivated, and the process of making chocolate. Chocolate gets its reputation for being healthy because of its ingredient cacao that contains powerful antioxidants. Cacao is very bitter so sugar is added to create a sweet treat. 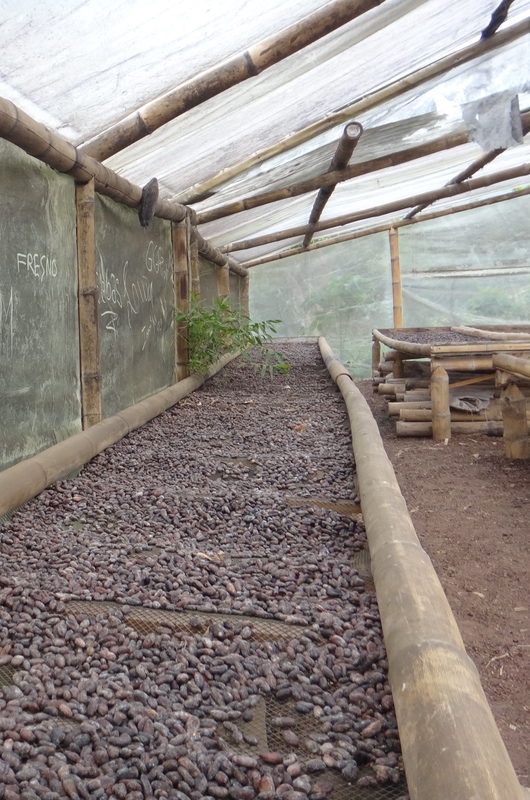 With a full bar of ingredients in front of us, we were able to prepare the cacao to our liking. From honey and cane sugar to cayenne pepper and BBQ sauce, we experienced Ecuador’s cacao in many different ways. Captain prepared his with lots of sugar! 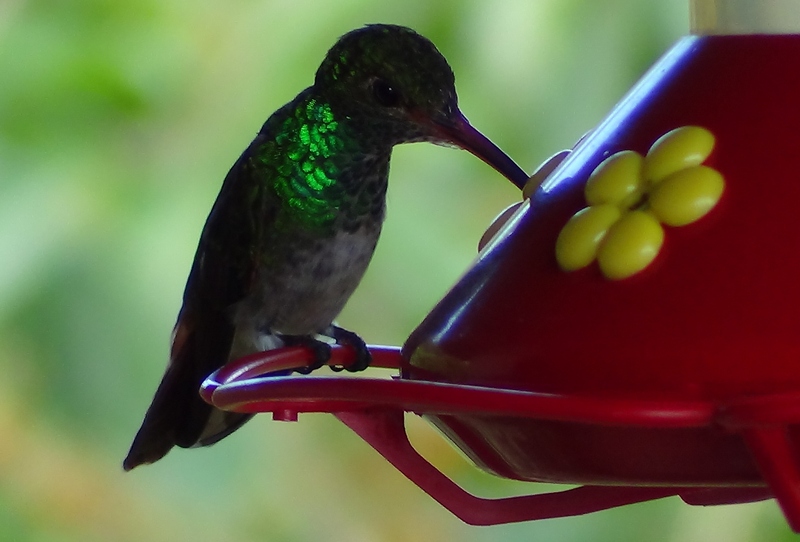 For five days I sat in my second story room, overlooking the stream and watching the neon hummingbirds sipping on their sweet nectar. The calming sounds of the moving water soothed my soul. My time was spent reflecting on our second experience of Ecuador. I gained more confidence interacting with the locals, embracing the philosophy that love is a universal language. With an a sweet smile and an open heart, there are no language barriers. Bonds were deepened with gringo friends from our first visit; new friendships were made with others who would surely have their place in our lives as well. Ecuador was feeling more and more like home. Time was also spent dreaming of our future in Ecuador. Our paradise on the Pacific…visions of the future were becoming clearer. Gardens of all kinds were brilliantly in bloom. Guests finding peace at our sacred space and me finding peace living the sweet life I am destined to lead. The thought of going back to the States was bittersweet. I would be returning to a job of following orders and spending most of my time working for someone else. With such a clear view of what I wish to do with my time, returning to the States to do a job I was less than passionate about would be a challenge. We had yet to reach our financial goal for moving to Ecuador so I knew another travel RN assignment was the means to an end. How long would we have to be in the States? Where would our next nursing assignment take us? I had to mentally prepare myself for my return…the life I would be living in the United States is very much different from the life I envision in Ecuador. The time came to leave; when passing through Immigration, a scowl appeared on the face of the woman sending us out of the country. There were several minutes of confusion as Captain and I were unsure of what was pursuing. She left the counter and returned moments later. Despite our lack of understanding Spanish, it was very clear: we had over stayed our welcome in Ecuador. We had assumed, like in Costa Rica, when we left, our 90 days in the country were reset to zero. Apparently, this was not the case in Ecuador. From the first visit, one must only stay in the country for no longer than 90 days total for the next year. Within the last year, we had two 2 month visits so we had over stayed our welcome over 30 days. Damn. We weren’t welcome back for another 9 months. Disappointment sunk in as I realized we would have to take a long-term assignment as we’d be back in the states for this many months. At least, we didn’t end up in an interrogation room being questioned about our lengthy stay or sent back with a hefty fine!